Our Age, commonly known as technology enables us to live the greatest scientific upheavals of the History of Humanity. We note, however, that the great discoverers are rare, especially for the benefit of the results as a team. The only area in which the genius of a single individual is still able to manifest what is art. This is the point of contact between the Clock and the master watchmakers who still manage to surprise us with technical discoveries that leave you speechless. One of these great masters is definitely Frederic Jouvenot. 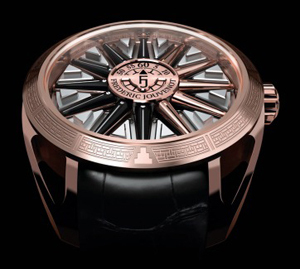 Jouvenot is almost a talent lent to watchmaking, as it began as an electronics engineer. Despite his young age (35 years just turned), Frederic has already to his credit the discovery of an electronic ecotomografo adopted by a leading medical institution in Switzerland. For pure passion, he has attended advanced technological studies, achieving brilliant academic record, place, what constitutes a point of arrival for the watchmakers builders: the tourbillon. His passion, become art, thus turns into a mission: to create extraordinary watches. The production of complex samples with very high technical value, involves the implementation of a few pieces, strictly signed and numbered. It ‘s the case of the latter two fantastic collections: Solar Deity and Ace. The first represents a revolutionary new way to read time, through a system of rotation of the index of the dial, simple-looking but very difficult to realize.